New York City Is Being Sued Over Inaccessible Subways. It's About Time. On Tuesday, April 25, two class action lawsuits were filed against New York City’s Metropolitan Transportation Authority (MTA), accusing it of systematically excluding people with disabilities due to a lack of accessible subway stations. Only 112 out of 472 stations — less than 25 percent — have elevators, making it the least accessible subway system in the United States. Other cities with older subway systems have far greater accessibility, including Boston at 74 percent accessible, Philadelphia at 68 percent and Chicago at 67 percent. In addition, the suits allege that existing elevators are often broken, leaving riders stranded on platforms or unable to get to their destinations. Of course, the MTA claims the lawsuits are “misplaced” and that they’re “committed to serving the needs of disabled customers.” But many of us with disabilities know better. The problems with subways may be underground, but they only scratch the surface of New York City’s systemic lack of accessibility and opportunities for people with disabilities. I use a wheelchair due to cerebral palsy and came of age just as the Americans With Disabilities Act took effect. My generation was the first to benefit from its opportunities as we moved into higher education, employment and independent living. Thanks to the ADA, I thrived in California, where I attended Stanford University and over the years headed south, to L.A. and later San Diego. Almost everything in California was wheelchair accessible. I could show up at a restaurant and there would be a ramp. I could hop on a bus or train or call a cab with little difficulty. I encountered occasional inaccessibility and discrimination, but for the most part I could go where I wanted when I wanted, just like everyone else. I thought it was like that in every major U.S. city. I was so wrong. I visited New York City for the first time in 2010. My first night there, I nearly flipped my wheelchair over when I drove into a pothole hidden at the bottom of a curb cut. My hotel room claimed to be accessible but was too small to move my wheelchair around. The Broadway musical I attended had good accessible seating, but there was no bathroom on the main floor of the theatre. I had to wait until after the show, then go to a fancy hotel down the street and get a key from the concierge to use their accessible bathroom. The next day, I decided to head for lower Manhattan via the subway, accompanied by my personal care assistant and two local friends. I wanted to see the Statue of Liberty, which had become a symbol of hope to me as I struggled with challenges in my life. My friends are seasoned subway riders, but neither of them have disabilities. We all assumed that 20 years after the passage of the ADA, the subway would be accessible. We were wrong. We found an accessible station in Midtown, with a working elevator — but it was disgusting, clearly having been used numerous times as a toilet. We held our arms close to our bodies and tried not to touch anything. Once we got downstairs, we found there was a large gap between the subway car and the platform, with a 2-inch step to surmount. My friends practically had to lift my wheelchair into the subway car, all the while worrying the doors would close on us. After changing trains and going through the same process again, we finally got to our stop, only to find the elevator was out of order — and none of the nearby stops were accessible. We had to go nearly all the way back to where we started and take a bus instead. In the end, it took us over two hours to get to Battery Park — a trip that would’ve taken someone without a disability 25 minutes. How ironic that I wanted only to see a proud symbol of liberty, but in the process I was deprived of the liberty most New Yorkers take for granted. 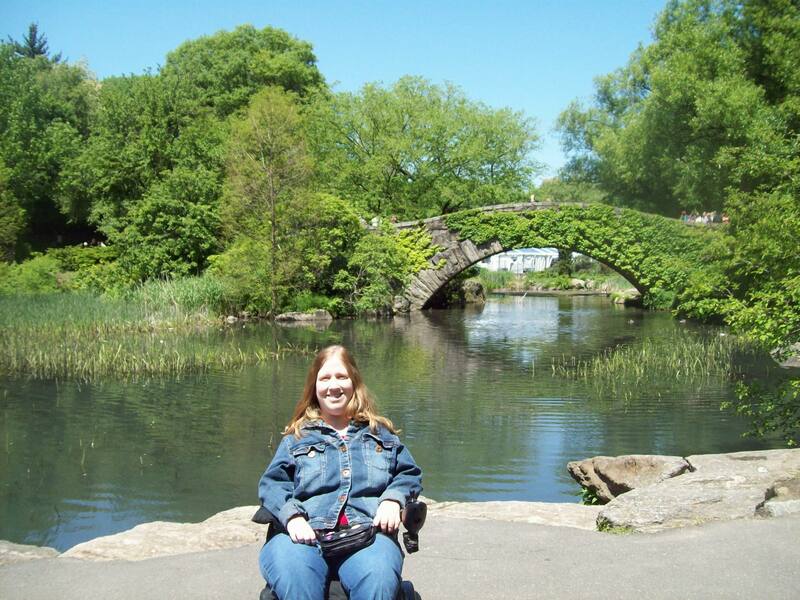 Karin in Central Park, 2010. As a travel blogger with a disability, I’ve been back to New York City several times since then, and every time I have encountered accessibility barriers I don’t see anywhere else in the United States. I find myself unable to eat in popular, newly remodeled restaurants, kept out by only a single step. I try to use the sidewalks but am constantly stopped by street corners where the curb cut is old and broken, or there is no curb cut at all. It’s hard to find an accessible taxi, and Uber’s growth threatens the cabs that do exist. These barriers keep disabled citizens and visitors from fully accessing the wealth of culture and opportunities New York City has to offer. I own an “I <3 New York” shirt, but it often feels like New York has no love for me and others with disabilities. I’ve watched places like my small Midwestern hometown transform into havens of accessibility, while the “greatest city in the world” (to quote “Hamilton”) lags a quarter of a century behind. I would love to move to New York City — it has the art, theatre, and music I crave — but how could I succeed in my professional and personal life when so many places are inaccessible? New York City claims to welcome people from every race, religion, and orientation, yet it is downright inhospitable to over 535,000 of its residents with mobility disabilities and numerous visitors whose tourism dollars feed the economy. To me New York City’s lack of accessibility should be considered a national embarrassment. These lawsuits are long overdue, and I hope they’re just the beginning. Nearly 150 years later, their great-granddaughter and millions of other people with disabilities are still among the masses yearning to breathe free. When will New York City build an elevator to the golden door? Have you encountered inaccessibility in New York City? Share your story in the comments.